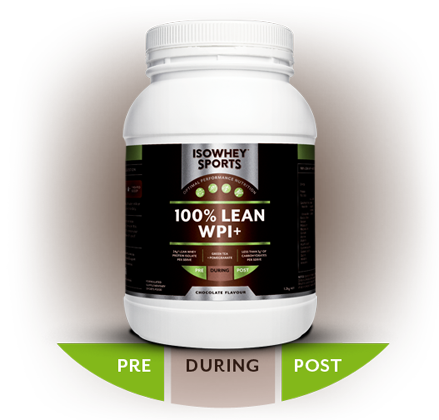 100% Lean WPI+ Chocolate boasts over 24g* of lean whey protein isolate with less than 3g* of carbohydrates per serve. Plus, 100% Lean WPI+ contains green tea, alkaline pomegranate, digestive enzymes, and probiotics for digestive balance. 22.6g* of pure protein from WPI per serve from grass-fed New Zealand cows using a cold filtration extraction process. Low carbohydrate; less than 3g* per serve. INGREDIENTS: Whey protein isolate (83%), sweeteners (xylitol, stevia extract powder), medium chain triclycerides powder, cocoa powder, green tea leaves powder, (Camellia sinensis), chocolate flavour, L-ornithine, xanthan gum, soy lecithin, pomegranate fruit rind powder, (Punica granatum), L-valine, enzymes, Lactobacillus acidophilus, Bifidobacterium lactis. WARNINGS: Contains milk and soy products. Contains xylitol: Excess consumption may have a laxative effect. Phenylketonurics: Contains phenylalanine. Contain 42.5mg caffeine per serve from green tea. Not to be used as a sole source of nutrition. Should be used in conjunction with a balanced diet and appropriate exercise program. Not suitable for children under 15 years of age or pregnant women. Should only be used under medical or dietetic supervision.